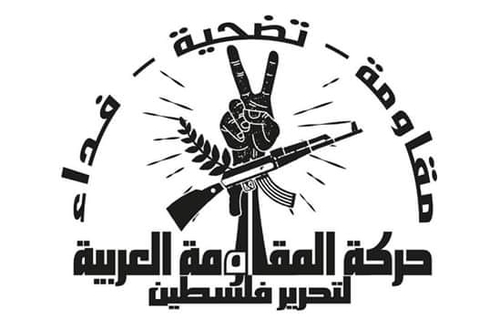 Emblem of the 'Arab Resistance Movement to Liberate Palestine'. On top: 'Resistance-Sacrifice-Self-Sacrifice'. Although there has been a crackdown on the group's social media presence, the group asserts that is operations on the ground are continuing. Based on the social media interactions I have viewed, the group would seem to have links with some pro-Syrian government Palestinian factions. In any case, today I was able to interview Abu Ali, the secretary general of the movement. The interview is slightly condensed for clarity. Q: When was the movement established? A: We are a popular revolutionary movement, established on 1 February 2019 CE. Q: Are you present in occupied Palestine only or in other countries like Syria for example? A: Present inside Palestine and a number of the Arab countries. Q: How does the movement differ from other resistance factions like our brothers in the Fatah al-Intifada Movement for example? A: We resist the Zionist enemy far removed from internal disputes. We are resisters and we resist and fight the Zionist enemy wherever it is found. Q: Are you an independent movement or do you have relations for example with the Islamic Resistance- Hezbollah? A: I cannot answer this question. Q: Does the movement aim to liberate all of Palestine from the river to the sea? A: Yes, we aim to liberate all the Palestinian land, and all the occupied Arab lands. Q: And this will only be realized through armed resistance? A: Yes, correct, and likewise the matter [will be realized] through implanting the thought of resistance and the creed believing in resisting the evil Zionist occupation. Q: What is your stance on the so-called Boycott, Divestment and Sanctions movement? Do you expect that this movement will be successful in realizing the liberation of Palestine? Q: Some activists launched this initiative. They mean boycotting the Zionist entity. They think that this economic and public pressure will lead to liberating Palestine. A: We are against any cooperation with the Zionist enemy. Q: Correct. But these people think that the economic boycott will lead to liberating Palestine without armed resistance. A: Boycotting means nothing to us. We believe in armed resistance, and it is the path to liberate our land from the occupier. Q: Of course there has been much talk about the future of the resistance in the region especially with the events in Syria. In your opinion is the victory of the Syrian government and its allies a crucial thing for the future of the resistance? A: Syria is the resistance axis, and the victory of Syria, the people of Syria and its great army and its first resisting leader is the victory of the resistance axis in its entirety. Q: How can supporters of the resistance support your efforts in resisting the occupation? A: By prayer and only thinking of resisting the occupation by all means. Q: Finally what is your position on the Hamas movement and the recent demonstrations in Gaza? Has Hamas betrayed the Palestinian cause? A: We are with any noble resistance only, nothing else besides.